It has been almost three years since my wife and I moved to Washington County in Rhode Island. Washington County makes up the southern third of the state and one island, Block Island. What a difference from up north! This is farmland, forest, and ocean beaches. The town we are in, Hopkinton, is especially rural with a total population of under 8,000 (not including cattle, sheep, chickens, horses, and rabbits). 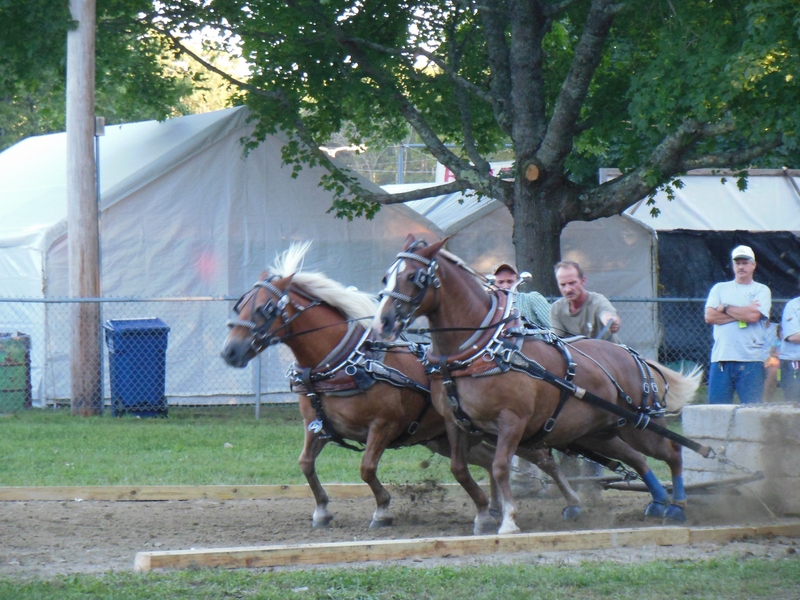 The biggest fair in RI is held right next to Hopkinton in Richmond. Until this year we had never been. Each August we would remark about the signs announcing the upcoming event, express our desire to attend, and then do nothing. There was always a reason to put it off. This year was different. We went to the fair twice in one day! 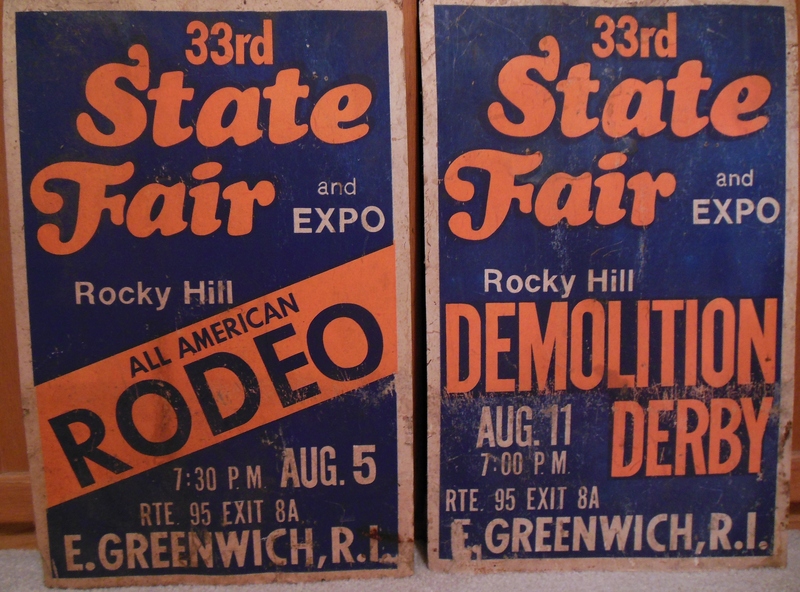 The only state fair we had attended in the past was the Rocky Hill State Fair that was held in East Greenwich. 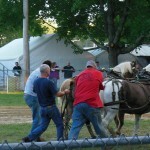 This was one of only two fairs in the state for many years. The highlight for me was the demolition derby. Rocky Hill closed down over 20 years ago. 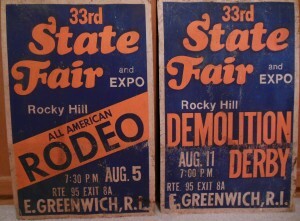 It had all the neat country attractions plus the ever-popular demolition derby. My parents took me once. I also took my young family there once . The fair closed down forever about 20 years ago. The time had come to check out Washington County Fair, only 3 miles from our home. I like the Chrysler products because they usually have dramatic styling not seen in many other cars. We took our grandson in the morning. I checked out the old cars display (loved the Plymouth Concord coupe) while Owen pet and spoke to every sheep in Rhode Island. The cows did not excite him as much as the sheep but he did get fired up by all the exotic breeds of rabbits and chickens. 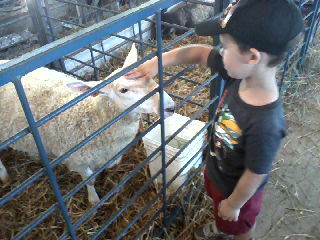 The sheep were gentle and my grandson was also. He loves animals! He even scored 3/5 on the basketball toss and won a dragon plush toy. The highlight for me was the display of some 70 antique tractors. I have no need for a tractor but still would like to park one right next to the shed. This proposal has not passed the spousal board of review (don’t think it ever will). After some 2 hours it was time for Owen to go home and rest. My wife and I had our arms stamped so we could return at night. 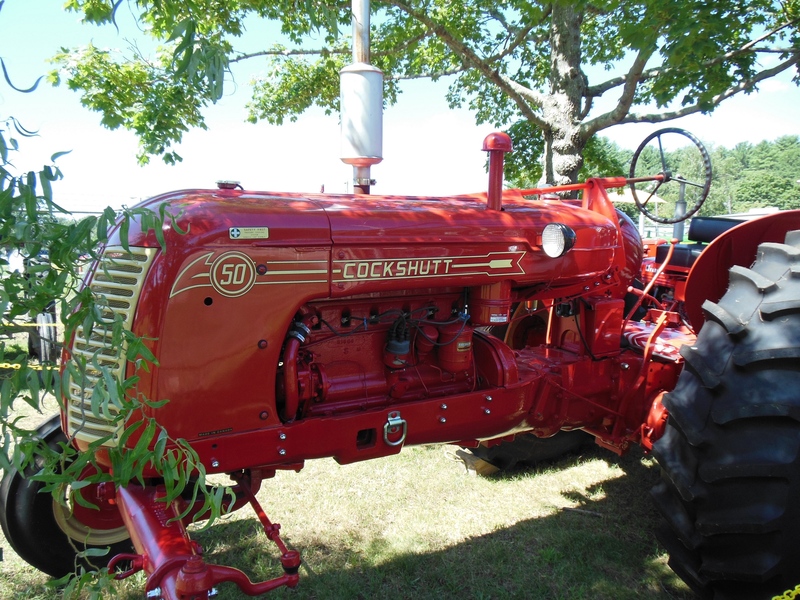 Have you ever seen a tractor as beautiful as this one? 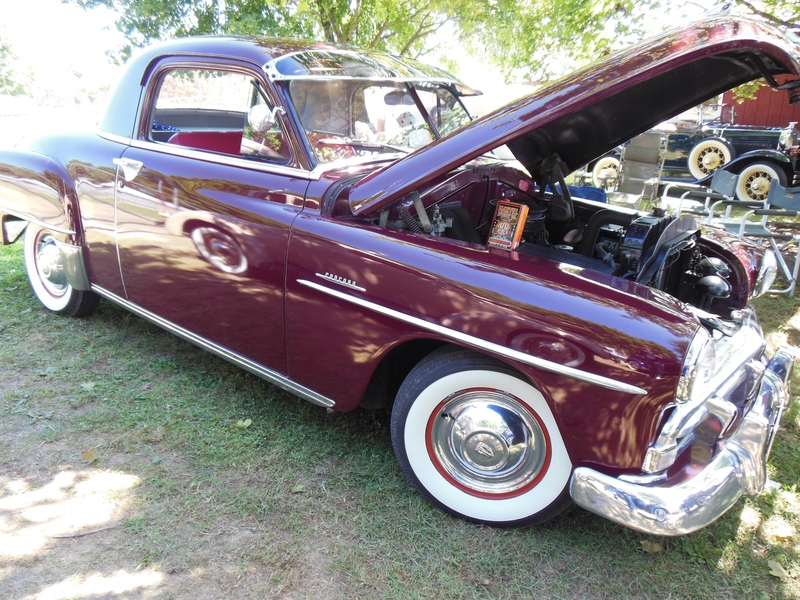 It took first place in a field of about 60 gorgeous machines. The night visit was even better. My wife had to submit to a total search of her purse as we entered. The security was tight but the smile and sweet attitude of the young lady who took care of us made it painless. 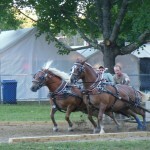 We went in and skipped most of the animal displays (been there, did that) and went right to the horse team pull. 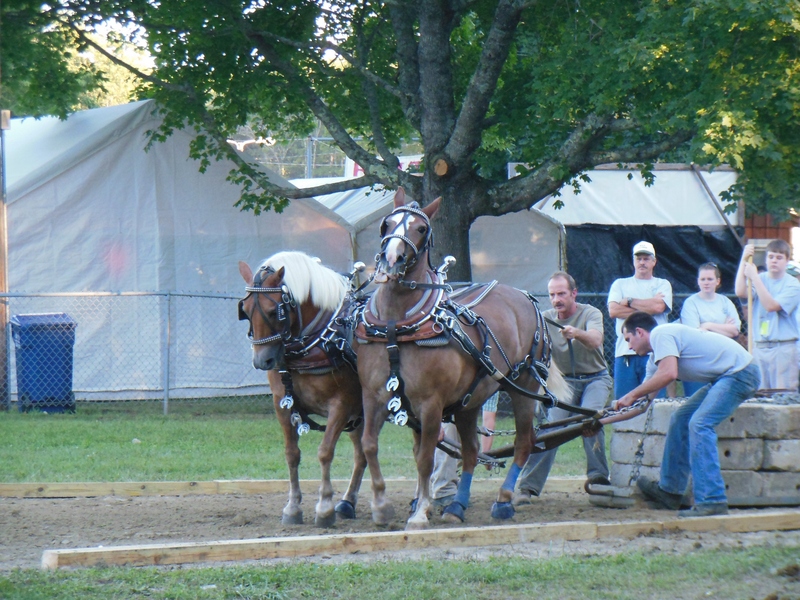 It’s like a tractor pull but with teams of horses doing the pulling. The 500-pound weights are loaded onto the sled. More weights are added for each trial. The horses are hitched to the sled .. this is the tricky part. It also appeared dangerous. And they are off! The action is sudden and intense. anticipatory energy that is barely contained. 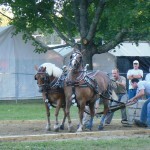 In several instances the horses took off before ever being tethered to the sled. The drivers were given three tries to get it right and sometimes they needed all three. I’ve included several photos and a video to give you the flavor of the excitement this event generated. We also hit the food shacks (dough boys, steak sandwiches, stuffed quahogs, corn dogs, etc…) that were run by various granges and volunteer fire crews. The lines were long, the food was great, and the people were wonderful. 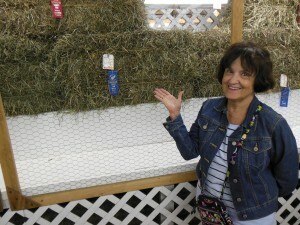 My wife thought it incredible that there was an award for the best hay. Here she points at the first place winner. We also spent some time in the various barn buildings where all the prize-winning produce is. Did you know that they even give a prize for first class hay? 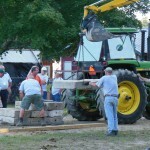 The final event we witnessed was the tractor pull. Think bigger sled and lots more horsepower. Each tractor would pull out of the waiting ranks, back down the long dragway, and then hitch to the sled. At the go the contestant took off in a roar of exhaust and clouds of dirt. Exciting? Nothing better! 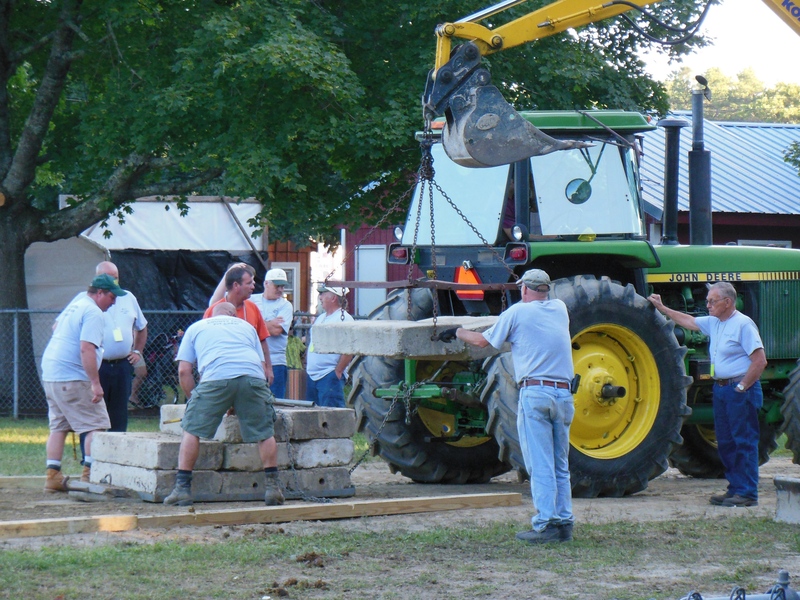 If you are in Rhode Island next August, don’t hesitate to check out the Washington County Fair. It is on Route 112 in Richmond. It will likely be August 13-17 (Wed.-Sun. ), 2014. This is the part of Rhode Island every visitor and resident needs to experience. We’ll see you there! Note: clicking on images will enlarge them to full size. If you liked the post please use the social media icons below to tell your friends. Thanks! 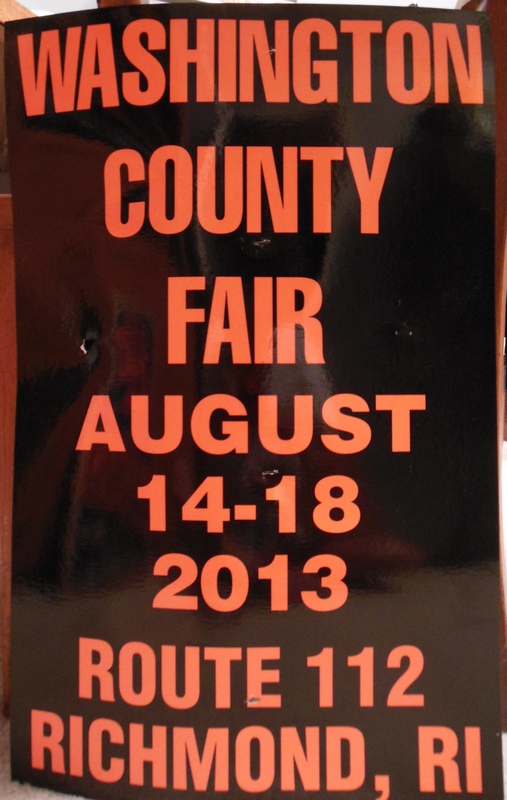 This was the poster for the 2013 Washington County Fair. This and the Rocky Hill posters have a place reserved for them on my garage wall. 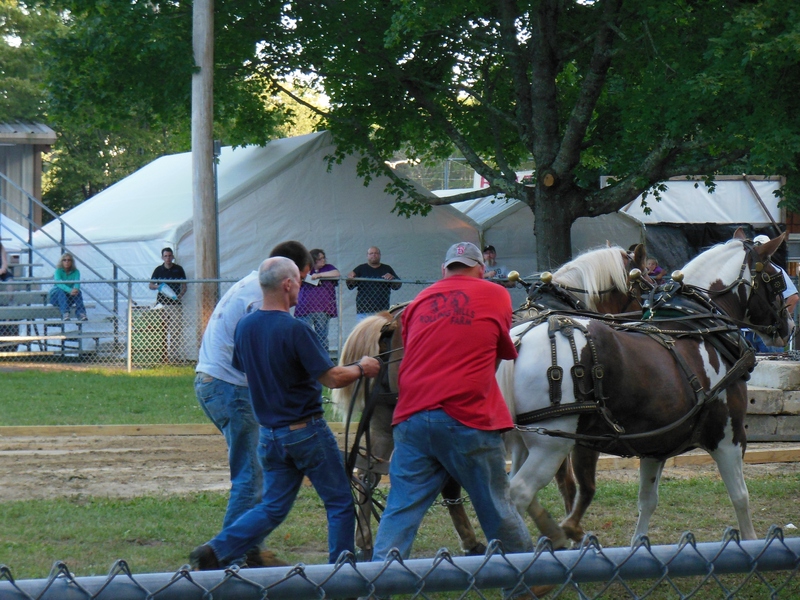 This entry was posted in Occasional Commentary and tagged 2013, antique, cockshutt, County, fair, hopkinton, horse, pull, Rhode Island, RI, Richmond, Tractor, Washington. Bookmark the permalink.